Global hotel giant Carlson Rezidor Hotel Group has yet again announced plans to enter the Maldives tourism market with the opening in 2019 of a Radisson Blu resort in the island nation. In a statement, Carlson Rezidor Hotel Group said Thursday that an agreement has been signed with Singapore-based Chang Hua Holdings to manage the Radisson Blu Resort Maldives. Scheduled to open in the first quarter of 2019, the property is one of the most anticipated new developments in the Maldives, in addition to being the first Radisson Blu resort in the market, it added. According to Carlson Rezidor Hotel Group, the resort is being developed in South Ari Atoll, and is accessible by a 30-minute seaplane journey, or a domestic flight from the main Velana International Airport to the Maamigili Airport followed by a 15-minute speedboat ride. 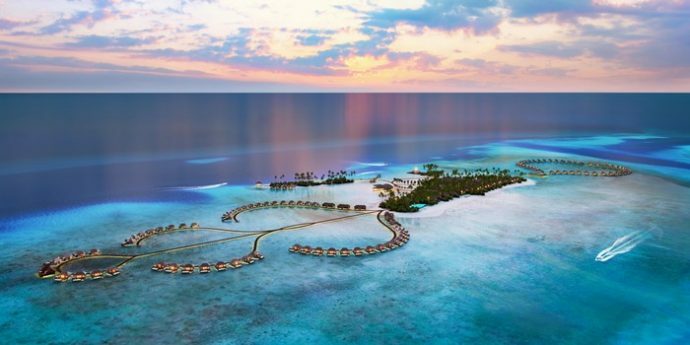 Maldives Insider understands that development of the Radisson Blu Resort Maldives is taking place on the island of Ranveli, which up until recently was home to the Ranveli Island Resort. Featuring 128 exclusive villas, including family villas and a premium overwater villa, the new Radisson Blu Resort Maldives is set to strike a balance between stylish contemporary design and a truly Maldivian resort experience with breathtaking views of the Indian Ocean. Set amidst some of the most amazing coral reefs, the resort’s first-class sea sports and dive centre will offer guests an array of activities, set for adrenaline pumping action. For those seeking to rejuvenate and restore, the yoga pavilion and spa will be the ethos of wellness as moves are practiced in the tranquil surrounds of the island. Dining at the restaurants and bar on the island promise to tantalise even the most discerning palate with unique cuisines and experiences. “As a global brand, Radisson Blu Resort Maldives will provide the international leisure market with a full range of innovative design-led products and services, delivering genuine and relevant guest experiences with Radisson Blu’s distinctive Yes I Can! service philosophy,” Thomas Hagemann, Carlson Rezidor Hotel Group’s Vice President for Future Openings and Special Projects in Asia Pacific, was quoted in the statement, as saying. “We are excited with our first hotel project in the Maldives and believe that it will be a success. Our partnership with Carlson Rezidor stems from their proven expertise and management capabilities. We are confident that the Radisson Blu brand will position us for solid performance, setting inspiring and authentic experiences for our guests,” Li Fei Chang, Managing Director of Chang Hua Holdings, said. The latest announcement by Carlson Rezidor Hotel Group, one of the world’s largest and most dynamic hotel companies, follows three unsuccessful attempts by the group to enter the Maldives market. Previous plans to open the Radisson Hotel Maldives in the satellite town of Maldives capital Hulhumale and The Radisson Plaza Resort Maldives in the island of Naagoshi as well as the acquisition of then The Regent Maldives, which is now run as COMO Maalifushi Maldives, later fell through. Radisson Blu is one of the world’s leading hotel brands, with more than 398 hotels in operation and under development globally. Located in prime locations in major cities, airport gateways and leisure destinations around the world, Radisson Blu offers vibrant, contemporary and engaging hospitality characterised by a unique Yes I Can! service philosophy. Known the world over as Hotels Designed to Say YES!, Radisson Blu hotels are first class hotels that celebrate leading-edge style and offer signature features that are empathetic to the challenges of modern travel, including a 100 percent Satisfaction Guarantee. Carlson Rezidor’s Asia Pacific portfolio has 117 hotels in operation across the region, including 51 Radisson Blu hotels. Carlson Rezidor has 78 more hotels in the pipeline for Asia Pacific.